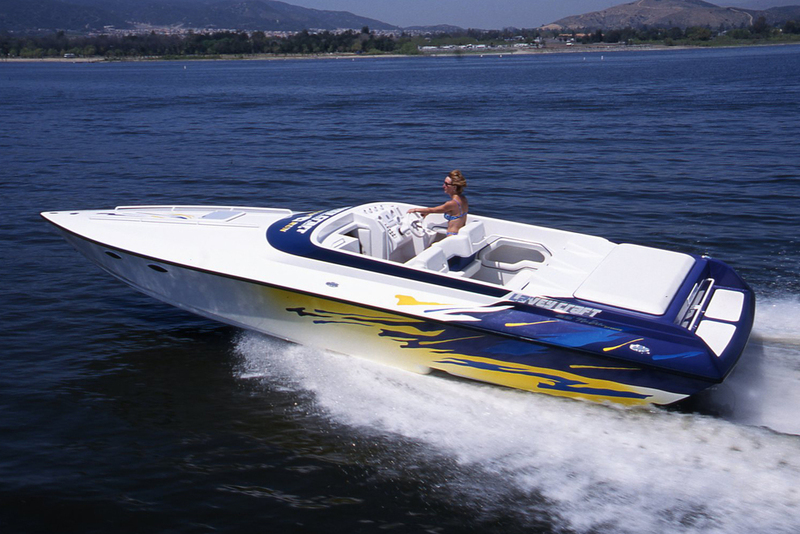 Factory 1 World Champion - 1999 Powerboat Magazine off shore boat of the year. This sweet machine is equipped with a Merc 600, Bravo 1XR drive, ITS steering system and 280K planes. It's fast with juice left to go over 80 MPH, using a 28 pitch 4 blade on the rev limiter. The Lavey Craft team did a sublime job with the dashboard, showcasing a carbon fiber finish with matching carbon fiber Livorsi gauges, all beautifully aligned so has to make the gauges appear to float above the dash. It also has a cool additional foot throttle to accommodate ambidextrous driving. Watch for it on Lake Havasu! "Lavey Craft's 29 NUERA offshore was designed right and built to take punishment. We loved the boat's maneuverability in calm conditions and got a thrill from its performance in the open ocean. With a little help from their friends, the Camires got everything right." SINGLE-ENGINE OFFSHORE BOAT OF THE YEAR - "What most impressed us about the 29 NUERA offshore were its handling manners and rough-water mastery." "Refined, tasteful, elegant and stylish inside. Every passenger area is exquisitely comfortable, including the roomy cuddy. Nice dash design. Lavey Craft's fiberglass work is among the industry's best, along with their gelcoat. Nice hardware selection." "The 29 NUERA is the flagship of the model line. The cabin is spacious and includes a freshwater sink, two TVs and more. The cockpit features quality gauges and other components, grab rails, storage compartment and plus rear seat are just some of the nicest touches."